If there's one thing you should know about me it's that I'm a planner and an organizer. I'm putting that to use for you here with a roundup of all the basic information you need for flying. Whether it's your first time or you just always seem to forget something, this post and the below checklist will come in handy for you! When packing your carry-on, there are a few rules you need to keep in mind. The first is the 3-1-1 liquid rule. Liquids must be 3.4 ounces each and need to be contained within a 1-quart zip bag. Each traveler is only allowed 1 of these bags of liquid in their carry-on. That always includes your essential, travel-sized liquids as well anything you need on the plane including medicine and entertainment. You'll also want an outfit or two and any forms of identification and payment. You're also allowed one personal item in addition to your carry-on bag. This includes a laptop bag, a purse, a tote bag, or anything the can fit on your lap or under the seat in front of you. You don't get an extra 3-1-1 included in this bag. If you're unsure about a particular item you want to take on the plane with you-such as a baseball bat or firearms, which aren't allowed-be sure to do some research or call the airport about the specific item. It's better to check and be sure than to arrive and have the item taken away because it's considered unsafe. And always know that, even if something is listed as approved, it may need additional screening when you are going through security. That's just one of the reasons why it's always important to arrive at the airport early! Your checked bag can pretty much contain anything (within limits, of course). This is where you want to pack your full-sized liquids, your clothes, and anything you plan on gifting that you don't want security to unwrap or dismantle. You are allowed to pack larger liquids such as oils, vinegar, and wine/liquor, but you want to make sure that you're protecting them with padding in case your bag gets tossed around. Always wrap anything fragile in a pair of jeans, a few shirts, or even bubble wrap if you have the room. 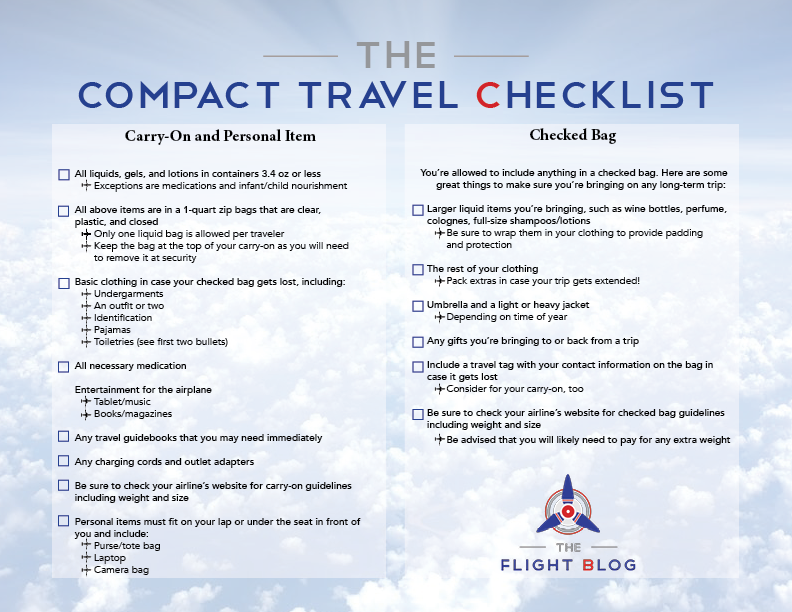 Additionally, here is a great link that will guide you through what you can bring on the plane and in your checked bag with details on everything.